We live in a world in which we are constantly bombarded with messages about who we are, how we are and who and how we should be. With social, cultural and media messages, family influences and rule-governed behaviors in constant crisscross, not to mention our own personal histories and collection of experiences, it can be hard for humans today to connect with what is intrinsically of importance to us—essentially, to our values—at any given time or stage in our lives. Yet, it is our values that ultimately shape our behaviors and actions throughout the course of our lives. Throughout more than 100 years of social scientific research, values have been a crucial piece of explaining social and personal organization and change, as well as the motivational bases of attitudes and behavior. While families, cultures, and societies are often organized around certain values and many values remain universal, both collective and personal values are also dynamic. What we hold as important often—if not always— shifts over time, which is why accessing values periodically can be of great worth and help people lead meaningful, fulfilling lives. Value clarification is one of the main aspects of Acceptance and Commitment Therapy (ACT). ACT is a unique, empirically-based approach to personal growth and healing that uses acceptance and mindfulness techniques with commitment and behavior strategies to increase psychological flexibility and agility. In ACT, values refer to what gives our lives meaning. And, values differ from goals in that we never accomplish a value. We can, however, live in alignment and accordance with our values, which can help us reach goals that are meaningful to us. When we truly tap into our values and use them as a compass when making daily decisions and the bigger life choices, we become more able to move through our lives with flexibility, agility and in a thoughtful direction, even when faced with challenges. Whether you’re a therapist looking for a new way to help your clients; an addiction counselor or recovery coach seeking an effective motivational interviewing tool; a business executive, leadership coach or HR professional interested in career development and team building exercises; or a parent or partner wanting to clarify mutual values and deepen relationships, the practice of value clarification can help anyone learn what resonates with their whole being—mind, body, and spirit. The mindfulness-based process of value clarification also helps people develop discrimination skills, identify and set goals, create informed mind maps and learn how to effectively live their lives in a meaningful way. 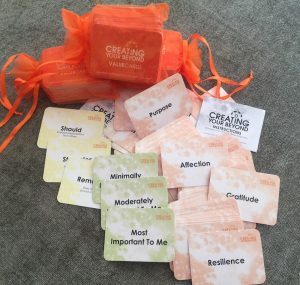 I created Creating Beyond Values Cards to use within my own therapy and coaching practice as a tool to help clients tap into what is intrinsically of importance to them in their lives in the present moment. Once clients connect to their values, they can begin to set meaningful goals and devise actionable steps to move toward what is most important to them in ways that honor and support who they authentically are. While initially designed for therapists and coaches, these easy-to-use cards can be used by anyone to define the overarching values that inform their overall life or they can be used to identify what values are important to them in specific aspects of their life, such as career, family, relationships, finances, community, health, etc. Essentially, Creating Your Beyond Value Cards help you get in touch with what is most important to you at any given stage in your life and serve as an effective tool for therapists, teachers, parents and their kids, between partners, and in the workplace, to name just a few. In just five simple steps, Creating Your Beyond Values Cards help you clarify values, which can be used to create vision boards or mind maps using radiant thinking. Radiant thinking, developed by Roger Wolcott Sperry, the 1981 Nobel Prize winner in Physiology and Medicine, uses whole brain thinking to enhance behavior through a value-based process that expands creative possibilities. Whether you choose to simply use the cards or engage in the deeper process of radiant thinking to develop a mind map based on your values, knowing and living values can help you and/or your clients live with a greater sense of purpose, meaningfulness, and direction. It becomes possible to be more engaged with life when you increase your awareness about what is most important to you on a deep level. And, in doing so, a sense of vitality and aliveness develop. Essentially, Creating Your Beyond Value Cards results can help anyone cultivate a life they love living. Other activities after completing a card sort are making a vision board, setting SMART goals or GROW goals, and journaling about the meaning of the values. Please use the button below or call to order. The full deck of 104 cards is priced at $39, shipping is free. Complimentary 20-minute phone consult with purchase. Brenda 720-260-7702 or contact me here.